A WWII-BUFF FRIEND of mine, who doesn’t fish, bought this book sight unseen and was disappointed to discover that it doesn’t even mention the Luftwaffe’s 1940-1941 bombing of Britain. I had the benefit of reading the subtitle, so I was pretty sure that it wasn’t going to be a history of the WWII Blitz or, for that matter, a nostalgic nod to the Blitz-Weinhard brewery’s late great Blitz beer. 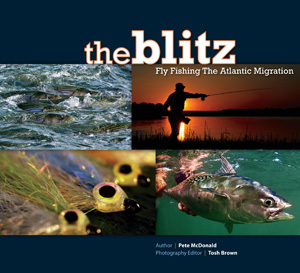 Every Northeastern fly fisherman who plies the salt craves the late-season, predatory occurrences of blitzing gamefish, and this book provides them a racy and almost lewd sketch of how good the fishing can be on the Atlantic coast. The book’s focus, naturally, is on those moments when predators, baitfish, birds, and angler converge. The clear emphasis is striped bass, which makes sense—after all, nobody ever made a weakfish-taper fly line, and most folks don’t have the inclination or wherewithal to chase bluefins offshore. Circling the book via dust jacket stokes the appetite for stellar photography, and The Blitz delivers. Given all the great photos, this would make a nice coffee-table book, assuming that you have a coffee table. (Something tells me that many of the anglers profiled in the book may not have one; in that case, a tying bench will do.) The most exhilarating photos, to me, are the pictures of breaching bluefin tuna. There are lots of hero shots as well. As for the writing, the tone is aggressive and rambunctious, in an exhilarating, X-Games kind of way. Sometimes the book sounds like it’s profiling jet-skiing big-shots, motocross competitors, or even Bassmaster champs. This definitely is not a book that celebrates the more contemplative aspects of fly fishing, but then the title gives that away. As writer Tom McGuane once noted, fishing’s contemplative moments come when nothing is going on, and during a blitz, everything is going on. And so the adrenalized tone is fitting. It’s also interesting that the book’s lunging narrative tone has become a hallmark of modern fly fishing writing. (Ever read an issue of The Drake?) I think that this new tone—which veers away from the sanctimony and gentility of, say, Schwiebert, in favor of a burlier, caffeinated cadence—is due in large part to the vastly expanded scope of the species we fish for. Trout rising to little bugs tend to attract a certain kind of angler, and therefore a certain kind of angling writer. These days, however, more and more folks are chasing saltwater fish. The targets tend to be apex predators. It can be hard work to find and catch them. These fish often have scary looking teeth and astounding strength and endurance. A different kind of angler pursues these fish, and a different kind of angler writes about them. When these guys (and they are, mostly, guys) write, they tend to resemble the ESPN analyst more than the professorial gent wearing tweeds, smoking his pipe, and laying out size-20 imitations to foot-long trout. The fishermen profiled here are fascinating, and if you fly fish the Northeast salt, you’ll love this book. If you’re looking for places to fish, you’ll get some ideas as to people to contact and places to start (although the book is by no means a where-to guide). Finally, it has to be pointed out that The Blitz is filled with enlightened concern for the environment. The Afterword encapsulates this with a sadly obligatory moan of recognition regarding the threats to the fish we love, and the message is clear: Respect your ocean and your fish. That’s as good an ending as I can imagine.